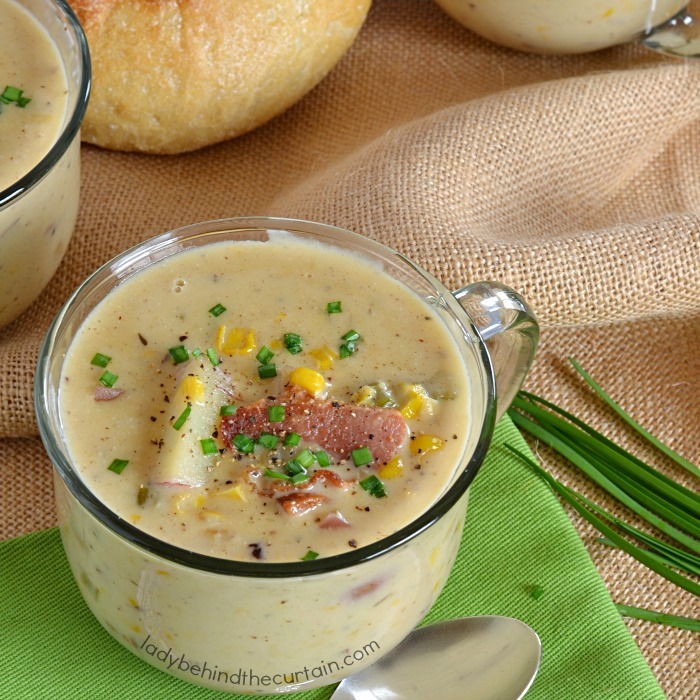 Hearty Potato Corn Chowder | Comfort Food that not only warms your insides but also satisfies your craving for something comforting and delicious. 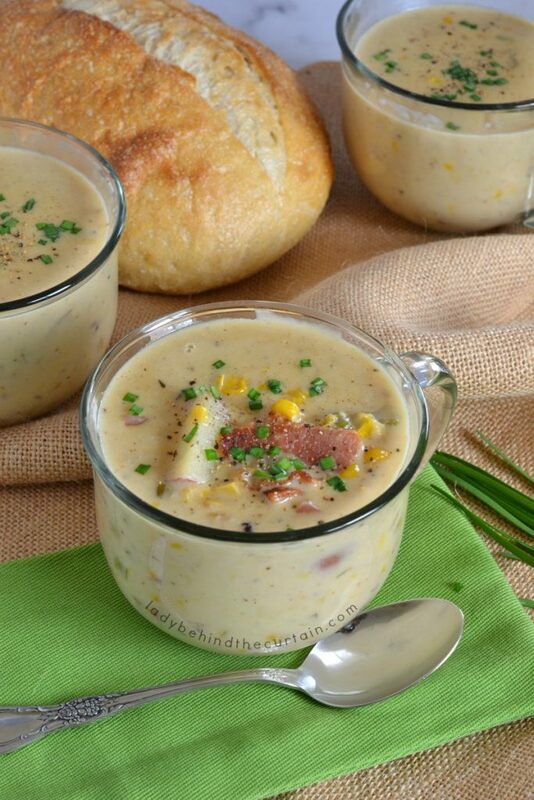 Serve this Hearty Potato Corn Chowder in a bread bowl, with croutons or a delicious slice of sour dough bread. 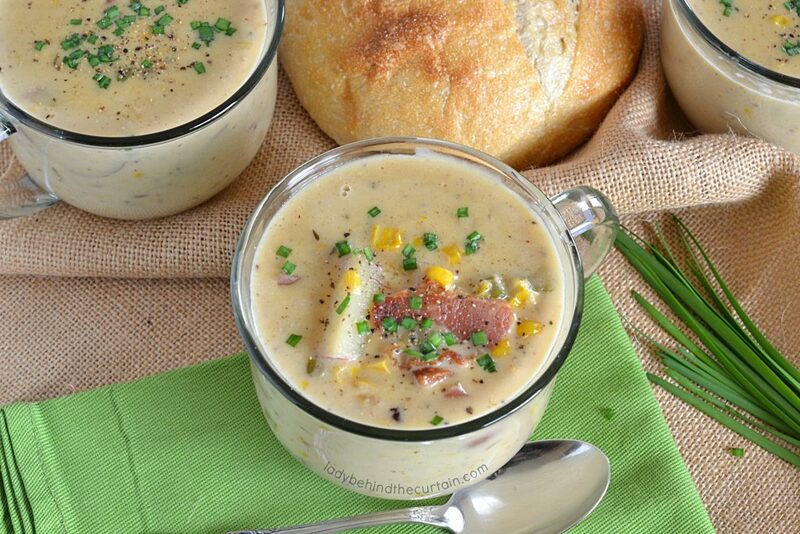 This incredible soup starts with fried bacon….I KNOW! You’re already sold. I mean anything that starts with bacon has got to be good….right? 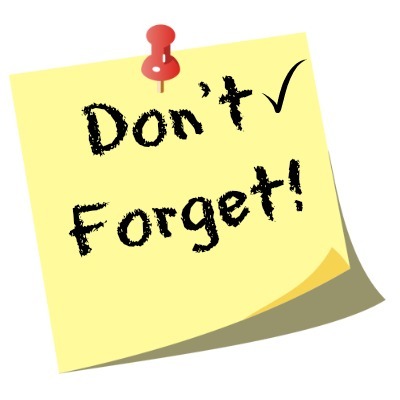 Moving on…..celery, onion, tons of red potatoes, thyme, creamed corn and more! Serve in small sour dough rolls as an appetizer, full size bread bowls or large bowls for dinner. Serving your guests several different options of the same type of food is one of my favorite ways of entertaining. It’s easy and can feed a crowd. I’ve created baked potato bars, salad bars and taco bars but my absolute favorite bar is a soup bar! Complete with toppings, bread and crackers. So next time you’re wondering what to make for a dinner party….THINK BAR! Here are my choices for a great soup bar. Starting with this Hearty Potato Corn Chowder, Short Rib Vegetable Soup, Fagioli Soup, Chicken Noodle Soup and Green Bean Casserole Soup. Now that’s a PARTY! 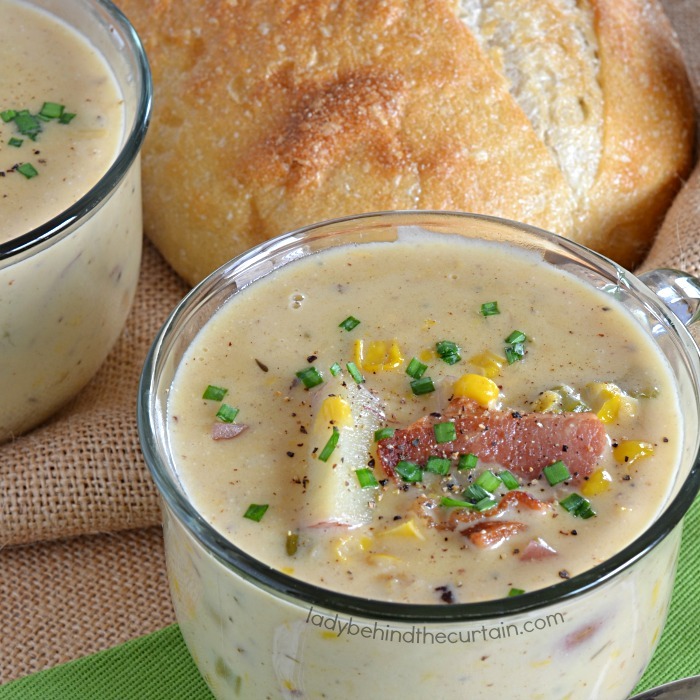 To….add this delicious Hearty Potato Corn Chowder to your soup Pinterest Board! Don’t have a soup board? Let me help you build one. My soup board has over 50 contributors with over 7K pins! What does this mean for you? VARIETY and lots of it! New soup recipes are always coming in! 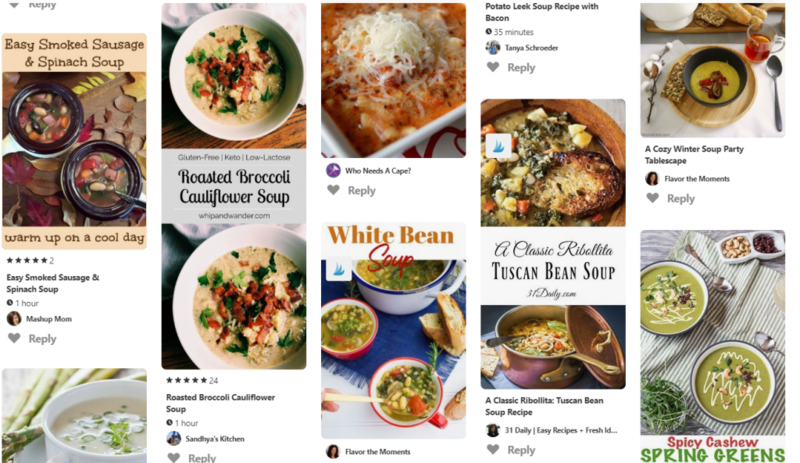 Click here to get started pinning amazing soup recipes—->>>>SOUPS ON. In a large pot fry the bacon until brown; remove bacon from the pan. Sauté celery and onion in the bacon drippings until tender; sprinkle flour over vegetables, continue cooking until brown. Return bacon to the pot along with the potatoes, bay leaf, thyme, corn, stock, salt and pepper. Bring to a boil and simmer 20 minutes covered. Remove lid, add the heavy cream, bring to a boil and simmer until thickened. More soup recipes you might like. CHICKEN AND DUMPLING SOUP and EASY BUTTERNUT SQUASH SOUP.